38 Mary responded, “I am the Lord’s servant, and I am willing to accept whatever he wants. May everything you have said come true.” And then the angel left. Greek, over the house of Jacob. Some manuscripts read, For the word of God will never fail. Mary (mother of Jesus) & the angel Gabriel. 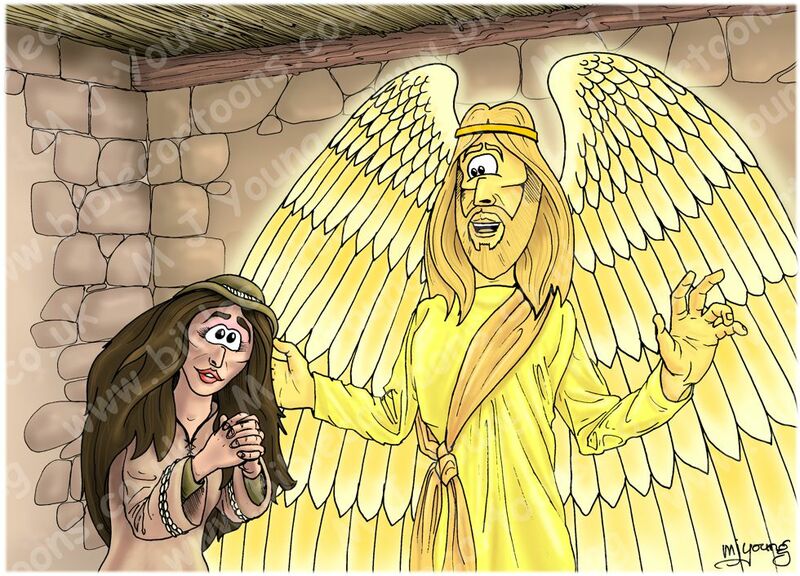 This is essentially a re-draw of the very early Bible Cartoon in the previous scene (Luke 01 – The Nativity – Births foretold – Scene 07 – Angel Gabriel & Mary.) 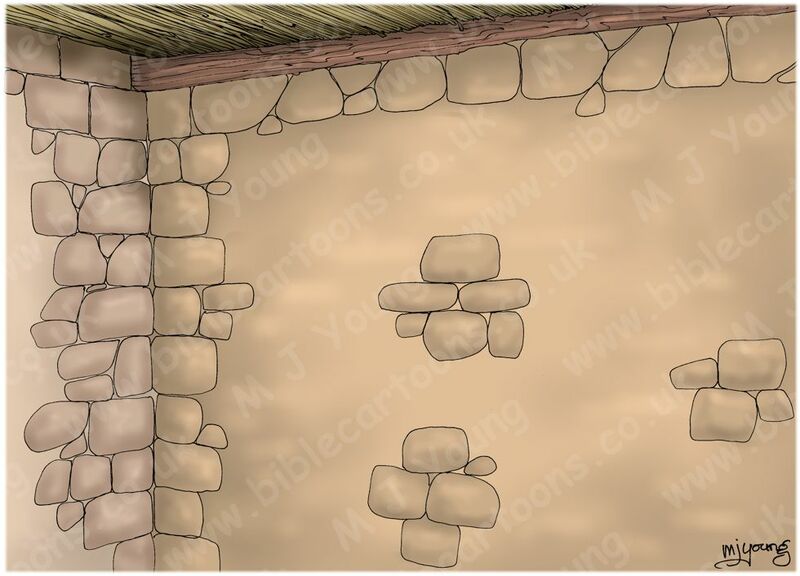 As you can see, this rendering is far more sophisticated than my early Bible Cartoons. The angel’s robes & wings have much more detail, whilst facial expressions & hand gestures are now more dynamic & realistic. I decided to keep Mary’s clothing colour & design features (the neckline & cuff details) the same, so that the two scenes still resemble each other. Mary has a scarf over her hair, but it looks a bit like a hat from the angle we see it! I wanted her to have loads of hair, which looks a little wild & unmanageable, sort of youthful & free. Mary was probably a teenager (maybe 14 or 15 years old) when she became pregnant with Jesus. I wanted to make here appear young & have given her masses of hair & long eyelashes to that end. 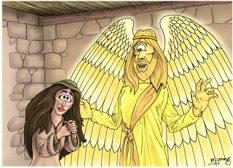 Unlike her relative Zechariah, Mary believed the angel Gabriel’s message from the Lord saying, “I am the Lord’s servant, and I am willing to accept whatever he wants…” Such obedience & acceptance, based on simple faith always pleases the Lord. “The angel told Mary she would have a Son. This Child would be the “Son of the Most High.” He would be of the Davidic line, and would be King over Israel, fulfilling the Old Testament covenant promises. In this one Person, Deity and humanity would be perfectly blended. In this one Person, all the promises of God and all the purposes of God for humankind would be fulfilled.